Sen. Lindsey Graham (R-SC) on Monday criticized President Donald Trump’s remarks on alleged Russia meddling in Helsinki, Finland on Monday and warned that Vladimir Putin may conduct surveillance with a soccer ball gifted to the United States. The South Carolina lawmaker turned attention to the U.S.-Russia cooperation on the issue of Iran’s military presence in war-torn Syria, calling on lawmakers to hold hearings on the matter to clarify the extent of the two country’s activities. “It is imperative that Congress hold hearings on the extent and scope of any cooperation with Russia in Syria regarding Iran’s presence,” he tweeted. 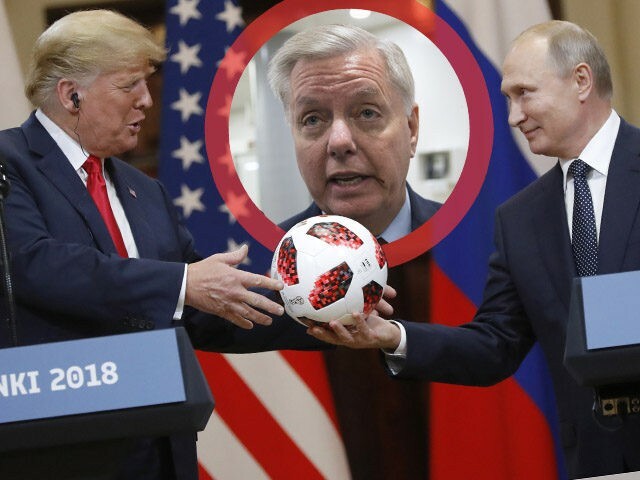 Graham then suggested the soccer ball Putin gave to President Trump be barred from the White House out of concerns it may be outfitted with spy tech. “Finally, if it were me, I’d check the soccer ball for listening devices and never allow it in the White House,” he tweeted. Concluding his remarks on the nature of U.S.-Russia military cooperation, Putin responded to President Trump’s earlier praise of Russia’s “successful” hosting of the 2019 World Cup by gifting him a soccer ball. “Speaking of football, Mr. President, I give this ball to you, and now the ‘ball is in your court.’ All the more that the United States will host the World Cup in 2026,” Putin said while handing President Trump a soccer ball. The United States will co-host the 2026 World Cup with Mexico and Canda. Putin: Speaking of football, Mr. President, I give this ball to you and now the 'ball is in your court.' All the more that the United States will host the World Cup in 2026. “Thank you very much,” replied President Trump.”We do host it, and we hope we do as good a job.” He tossed the ball to first lady Melania Trump for her to hold and was run through a security scanner by U.S. Secret Service shortly after.